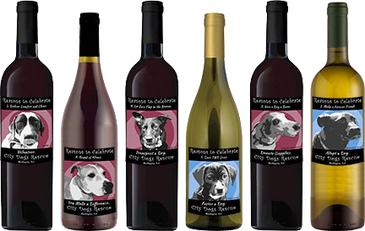 Our Benefit Wines program offers organic red and white wines with a portion of sales donated to City Dogs Rescue: $6 of the purchase price of each individual bottle, $22.99 from the sample package and $34.01 from the collector's package will go to City Dogs Rescue. Check out the creative labels featuring City Dogs Rescue dogs! Help spread the word and share the link. Order one bottle, the sampler package or the entire collection today! You may also order by mail by downloading the order form (PDF). Note that wine can be shipped to addresses in most states, but due to state law cannot be shipped to Maryland. If you are a resident of Maryland, you might want to consider shipping to a work or friend's address outside of the state.